Zimbabwe's new Prime Minister, Morgan Tsvangirai, has vowed to stabilise the country's shattered economy and end political violence. The former opposition leader addressed thousands of cheering supporters after being sworn-in under a power-sharing deal with President Robert Mugabe. Mr Mugabe, who administered the oath to his long-standing rival, has promised to co-operate in the unity government. Zimbabwe faces rampant inflation, a cholera epidemic and 90% unemployment. The international community has promised additional aid to the country only if real changes take place. Addressing a rally at a stadium in Harare, Mr Tsvangirai said the government had to "get the country working again". "The first priority is to stabilise the economy," he said. "The economic collapse has forced millions of our most able to flee the country. This must end today." High emotion for MDC supporters? Calling for an end to political violence, he said Zimbabwe could "no longer afford brother against brother, because one happened to have a different political opinion". He said the government would make food "available and affordable", and promised to focus on the cholera crisis that has killed more than 3,400 people. All public sector workers would be paid in foreign currency, he added, without saying where the money would come from. "The most important issue is that we are opening a new chapter for our country¿ there can be no turning back on the political agreement which each party has signed," the new prime minister said. Mr Mugabe, 84, who has ruled Zimbabwe with his Zanu-PF party since independence from Britain in 1980, said he would co-operate with Mr Tsvangirai. "I offer my hand of friendship and co-operation, warm co-operation and solidarity in the service of our great country Zimbabwe," he said. There has been political turmoil in Zimbabwe since last March, when Mr Tsvangirai, who leads the Movement for Democratic Change (MDC), won the first round of a presidential election. He refused to take part in a subsequent run-off in protest against attacks on his supporters. A final deal on power-sharing was reached in January, after Mr Tsvangirai returned to Zimbabwe following an absence of more than two months for fresh talks with Mr Mugabe. The cabinet in the new coalition government will be sworn in on Friday. There is deep scepticism about whether it will work, says the BBC's southern Africa correspondent, Peter Biles, in Johannesburg. At best it will be a transitional arrangement leading eventually to a new constitution and fresh elections, he says. Zimbabweans also reacted with cautious optimism. Harare businessman Ian Stephens said it was too early to celebrate. "It depends on how co-operative Mugabe is and whether he can be trusted. But he no longer has absolute power and that could be the turning point," he said. UK Foreign Secretary David Miliband welcomed Mr Tsvangirai's inauguration as a "step forward", but voiced concern that Mr Mugabe remained as president. "While Morgan Tsvangirai is acknowledging the crowds, behind him is a lurking figure and that figure is President Mugabe, who has tyrannised that country and bought it to its knees," he said. The international community stood ready to offer additional aid to Zimbabwe but it depended on the actions of the new government, he said. A US State Department spokesman congratulated Mr Tsvangirai but said sanctions would stay until President Mugabe showed he was sharing power. 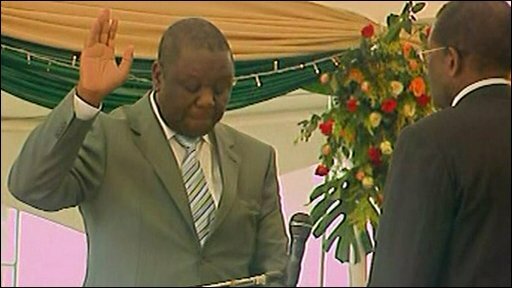 South African President Kgalema Motlanthe said Mr Tsvangirai's swearing in "is a vindication that our approach to the crisis of Zimbabwe all along has been correct, despite scepticism in certain quarters". Mr Motlanthe called on the international community to lift sanctions on Zimbabwe and turn its attention to Zimbabwe's humanitarian crisis.